I fell in with the piece, and that love led me to the contemporary work of fiber artist Michael Cook. This is a person I so wish I could have dinner with. 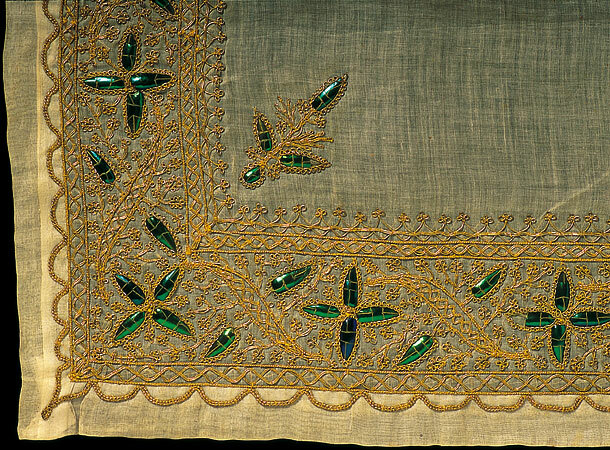 Below is a detail shot of one of Cook's beetle wing pieces. Now you're feeling it, aren't you?! They are so beautiful - like living jewels. Not even mentioning the deeper, more disturbing thing about stitching a wing - a flying thing - down forever. "...the wings are actually quite sturdy, like a fingernail...[fiber artist] Victoria Z. Rivers taught me the best way to pierce them. The wings are steamed in a colander for five minutes over boiling water, then pierced with a needle held in a pin vise. A cork behind the curve of the beetle wing will protect the wing and your fingers. Be sure to pierce from the shiny side to the dull side, if you do it the other way, it will split..."
Cook stitches the wings to fabric using a small #10 needle and silk embroidery thread spun from his own moth colony. You can find more of Michael Cook on his website. He has published a wealth of information about silk manufacture and culture. 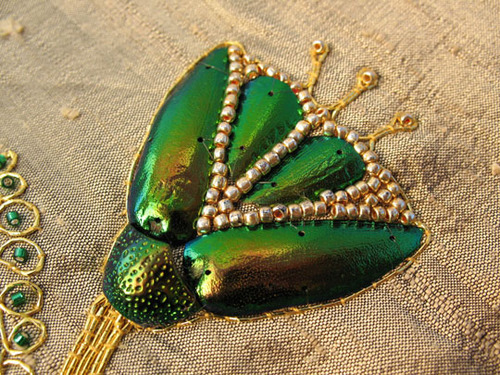 There is a great online article about beetles in textiles here. 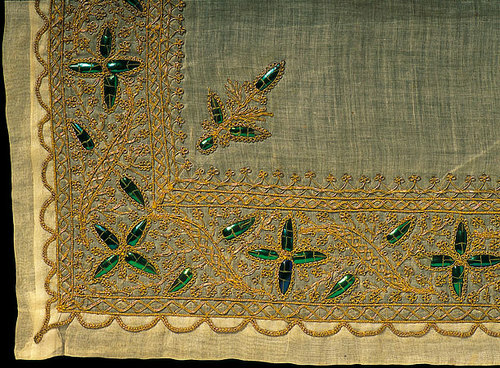 For general information about the history and techniques of beetle wing embroidery, Michael recommends checking out this book by Jane Nicholas. Can't wait for mine to come in the mail. Over the weekend, I flipped through my April issue of Print magazine, and found an article about the Center for Excellence of Digital Inkjet Printing of Textiles at Philadelphia University. British designer Julie Haslam uses this technology to produce her Domestic Bliss home goods collection. 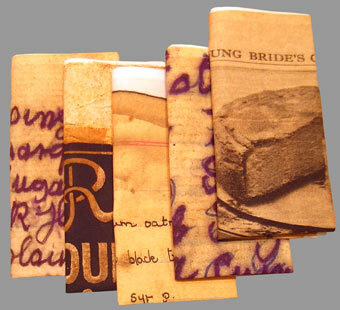 These napkins were inspired by the handwritten recipe and craft files that belonged to Haslam's grandmother. I've been spending down my PayPal account this week over on etsy. Did you know about Etsy's Alchemy project? 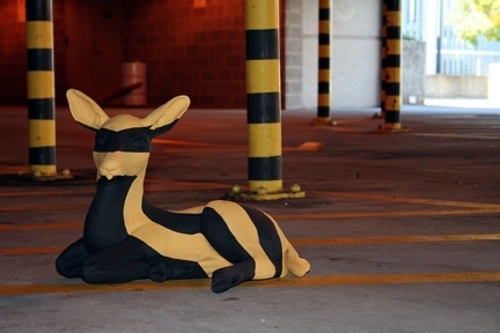 It links buyers with artists interested in making custom work. Think of something, anything, you want made. Then post a request on Alchemy and wait for the bids to roll in. Inspired by Oldschoolacres, I posted a request for a hand carved rubber stamp of the two kitties. I received about five bids but made a deal with Tresijas because I like the way her stamps look. This is one of Tresija's helicopters - can't wait to see the kitties! Dang. It was one of THOSE days in the studio. 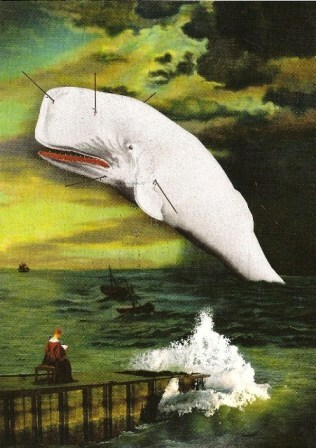 I threw harpoons at Lou Beach's whale and it wouldn't die for me. I hated what I made. I wasted precious and rare materials. I wanted to give art up for good. I've spent the rest of the day trying to convince myself that process really is as important as product. That's what I tell everyone else. And I believe it when I say it to them. But that logic isn't working on me. See more at the artist's website: www.merriewright.com. My love affair with felt began at Robin Richman in Chicago's Bucktown neighborhood. 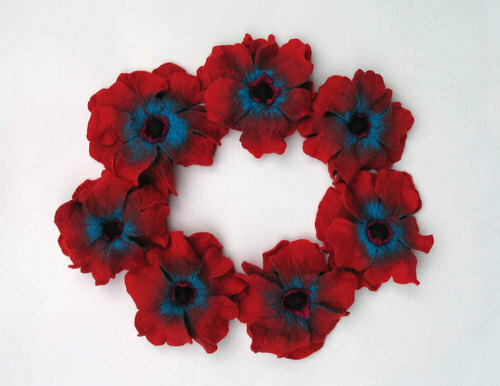 That's where I first saw Karin Wagner's felt flower jewelry. I love the intense pigments in this necklace. I own two Karin Wagner pieces - a flower brooch and ring. The ring covers nearly half the fingers on my right hand. It's hard to have a bad day when you have that on your finger. I've been thinking about my garbage today. In fact, we think about our garbage every day. You would too if you had to drive your bags five miles to the dumpster each week! And, Montana doesn't have recycling. Not even cans. Everything goes in the bin. So I've learned to reuse things in all kinds of ways. I use old plastic containers and lids to store little things, or for messy tasks like mixing dye, paint or glue. And since my studio doesn't have running water in winter, I find you can never have too many on hand filled with water for cleaning brushes or hand washing. Smaller plastic packages in interesting shapes make great forms for casting resin. Cardboard from food packages can be used as book boards covers. I also use cardboard to scrape paint on a canvas or clear up messes. Styrofoam meat trays make excellent paint palettes. Interesting cardboard boxes are saved for "shrines." I use old magazines to test-fold hand-made books and pop-up elements, protect my work table from glue, and of course, collage. Paper from the shredder and dryer lint can be used to make pulp for handmade paper. I make what I call "deer salad." Any vegetable that is past its prime goes into a bowl and is thrown into the far end of the orchard for animal munching. You can't call it compost because the food is never there the next day. Except for celery. Deer won't eat celery. And that's the only thing in the world a deer won't eat. I cut fruit in half and put it on a tree stump for our favorite squirrel, "Roy." Food that is still good can be thrown into soup and frozen for our lunches. We eat lots of soup since we both work from home. Instead of paper towels, I have a liberal supply of yellow Costco brand microfiber cloths on hand. People make fun of me because I have so many of these yellow things, but they clean so well with hot water, you don't always need chemical cleaning products. Incoming cardboard boxes are cut flat and Styrofoam peanuts go in a big trash can in our garage for future mailings. Jars are saved and sterilized to pack cherries at the end of the summer. The summer 8,000 pounds of our cherries went unsold was the summer I learned to can. For years now, I've been a subscriber of W magazine. Check out Cairo. No one sells clothes like W.
Except for maybe V magazine (seriously), which I first stole from my Miami hair salon six years ago and now can't live without. 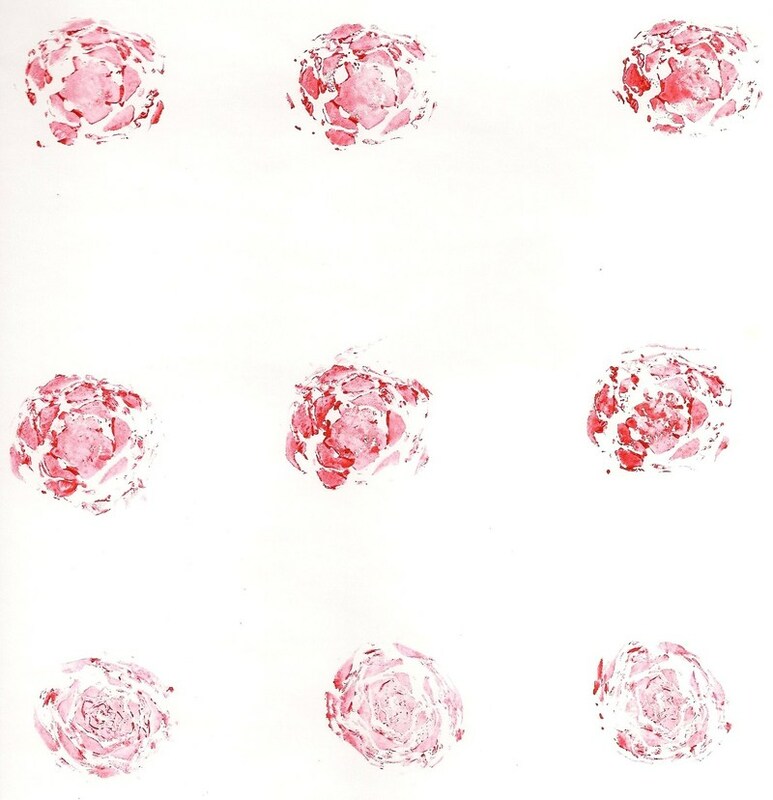 It's a wilder version of W. The images above are from V's "Beauty" section. After a careful read-through, I rip the magazines apart and alter the images for my art work. Along the way, I glean valuable information. In this month's W, I was happy to see that 80's fashion icon Norma Kamali has agreed to launch a diffusion line at Wal-mart. 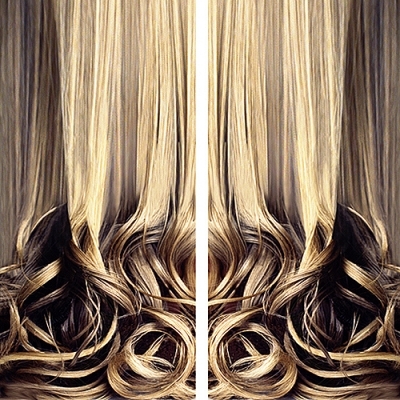 The line will launch in select stores in Fall 2008. She is already selling diffusion lines through Everlast Activewear and Spiegel. Kamali follows a parade of designers reaching out to the low-price market. Check out Vera Wang at Kohl's; Ralph Lauren's American Living at JC Penney; and of course, Target's Design for All initiative. 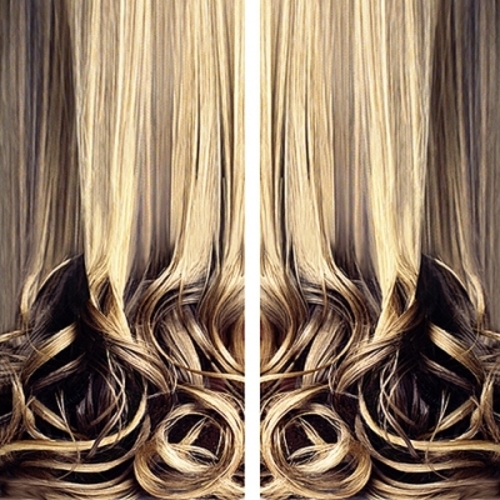 Nicolette Brunklaus printed "Blond Curtain" on 100% silk with a digital inkjet textile printer. Each panel measures 55" wide by 118" high. 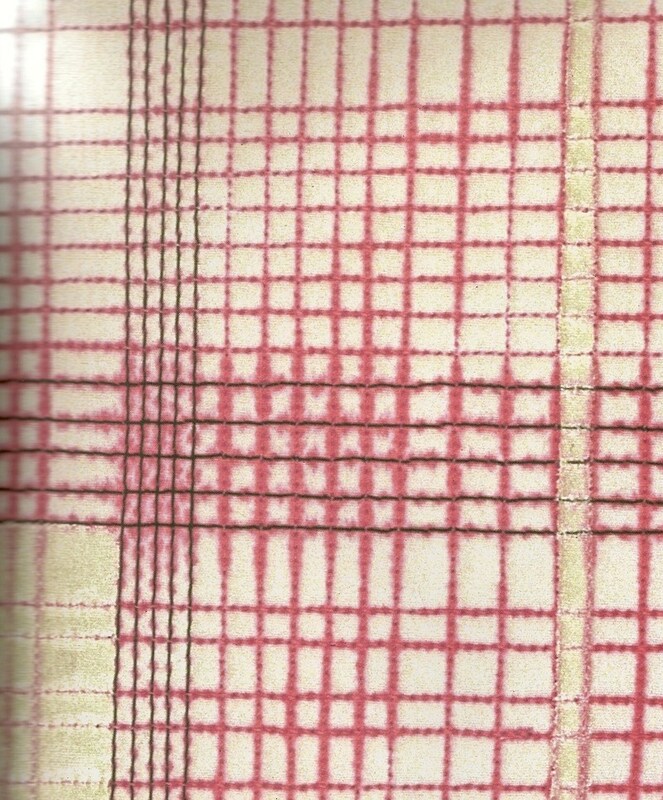 Digital inkjet allows textile designers and artists to play with and print on fabric in completely unexpected ways. 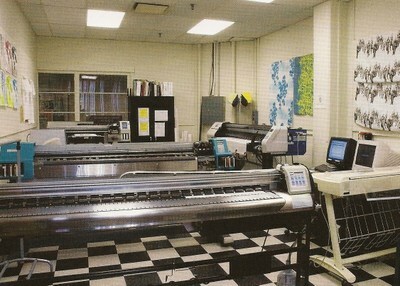 The computer allows artists to upload, manipulate, and layer digital images - even video - and print artwork directly on fabric in a single run. This is a dramatic departure from the work that can be produced using traditional rotary screen printing, which requires multiple screens for multiple color runs, and strict size limits for intended designs. As a flexible and relatively affordable surface design technique, digital inkjet seems to be catching the attention of artists and designers on a limited budget and those frustrated by the creative limits of rotary screen print. 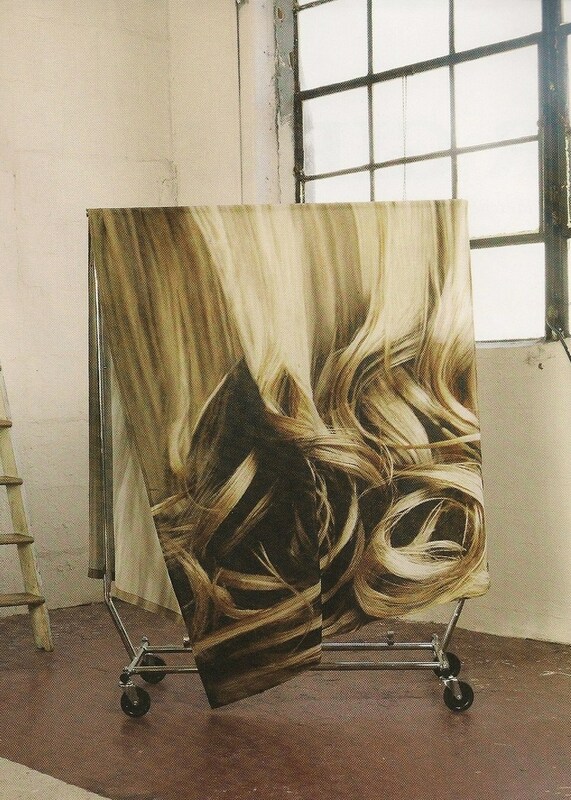 Rather than taking up space on inventory shelves (hoping for a sale), pieces like "Blond Curtain" can be printed on fabric one-at-a-time as each order comes in. It's a whole new way of working, and the one leading the way is Hitoshi Ujiie at Philadelphia University. Lately, I've been thinking alot about Shibori. Probably because I just bought this skirt, and the family teenagers have been begging me to organize a Spring tie-dye session. But, actually, tie-dye is to Shibori what paint-by-numbers is to Rembrandt. 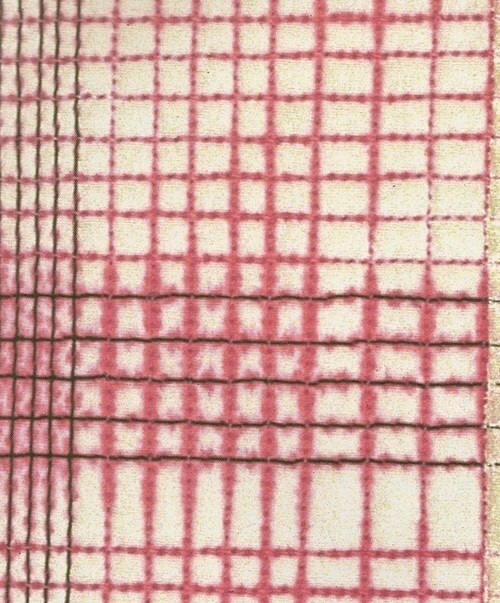 Shibori is a centuries old, traditional technique for embellishing kimono fabric. You'll see in this video how thousands of tiny, hand-tied knots create a dye resist on the fabric's surface. I've heard it said that some women spend their entire working lives tying the same knot, over and over, all day long. Though this video is in Japanese, I think it gives a better introduction to the techniques and products of Arimatsu Shibori than I ever could. Spring in Montana is beautiful and amazing. Today I opened up the studio doors and let in the fresh air. It was the first time I'd been in there since November. I had trouble concentrating - I found that I don't like to mess up my pretty new floors. A first. 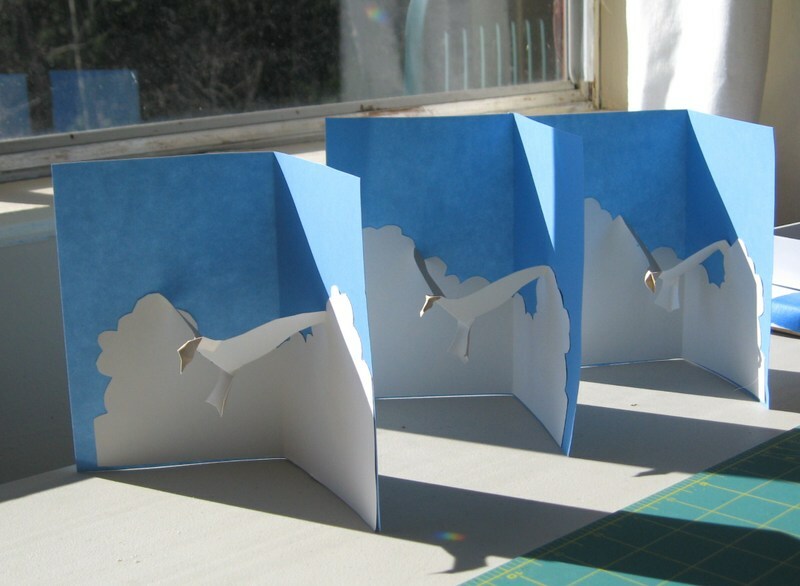 I fooled around with wood cut for awhile and then made a few pop-up cards. 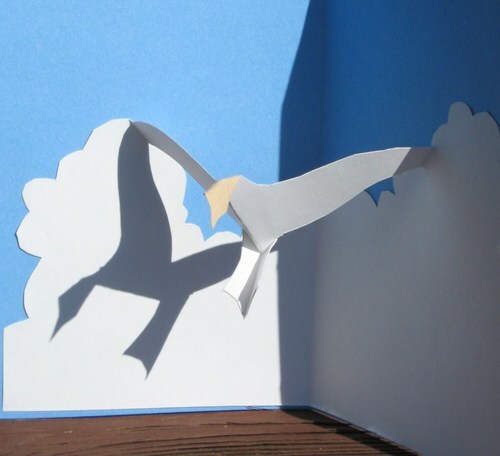 Its almost like the seagulls were plucked out of this sky and glued to paper. 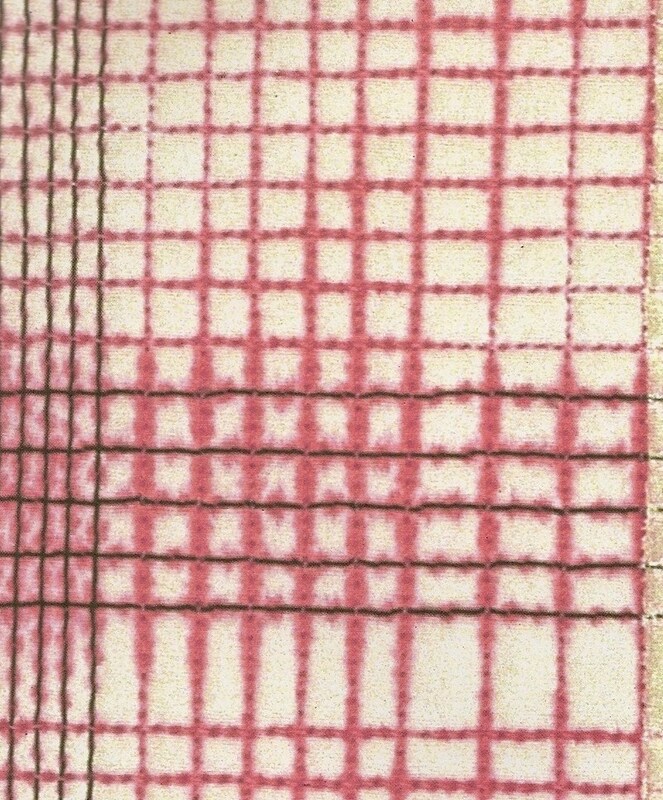 And while we're on the topic of surface design techniques, how about this? Jeanne Williamson stitches a quilt sandwich, then paints the BACK SIDE with fabric paint. The paint seeps through the stitch lines in a deep and meaningful way. I'd like to try it with the sewing machine embroidery techniques demonstrated in this Threadbanger video. This summer, I'm going to be ALL ABOUT the surface design techniques laid out in Jeanne Williamson's Uncommon Quilter. The Women's Liberation Movement did not result in either liberation or movement. Discuss. Ok. What we are looking at here are wax crayon rubbings of pea pods on fabric. The wax is melted into to the cloth with a warm iron. Williamson has appliqued the rubbings on to a DRYER LINT quilt sandwich. I don't know what I'm going to do with this idea, but I absolutely can't wait to try it. Buy the book - it's amazing. Deschutes River, near Bend, Oregon, originally uploaded by twokitties.typepad.com. 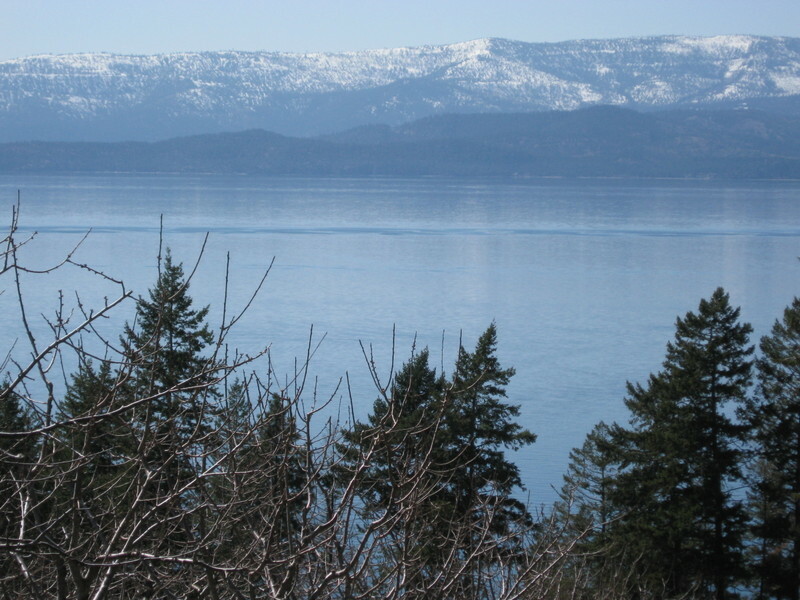 By this time tomorrow, I'll be snuggled up in my bed in the lodge. The sounds of the creek beneath my window singing me to sleep. If I'm lucky, the weather will be snowy. My husband starts a wood-burning fire on cold mornings and keeps it going all day. All year, he sets aside special logs for our fires. Lots of pitch means lots of crackling noises - and we love that. Knitting group on Wednesday and walks with Buddy the dog, but other than that? I'm free. I want a Tamar Mogendorff bird house wall. Like I've never wanted anything bird before. But at $185 a pop, this will have to remain a dream. 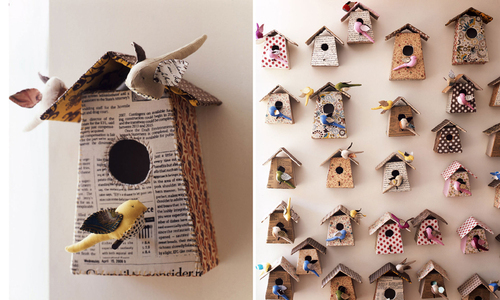 Why is is that some Martha projects produce wonderful results at home and others are simply impossible to replicate? 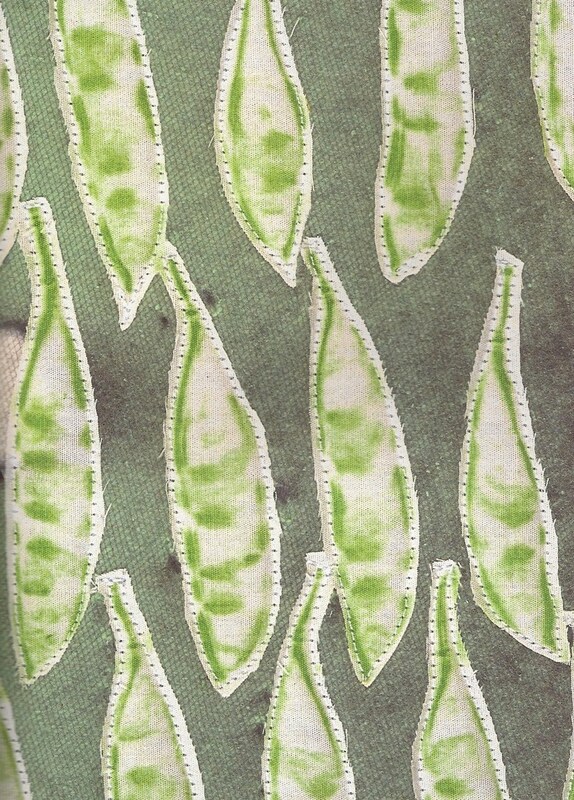 I was so disappointed in the results of these vegetable prints. I had high hopes but the results just weren't worth the time. And these old photos framed with pine cone petals? I loved the idea and still do, but it took me nearly three months to do just fifteen of them for my Christmas tree. It is harder than a son-of-a-gun to take apart a pine cone. It is harder still to keep them in place until the glue sets. For that project I rigged an elaborate set-up on my work table that included my husband's fly-tying vise and three different kinds of glue. I could envision the Martha workshop: hundreds of workers with bloody, sap-sticky hands on a deadline for the photo shoot. Good times. This post from Threadbanger inspired me. GirlPopcorn gives a "how to" lesson on embroidery using line drawings and a regular old sewing machine. 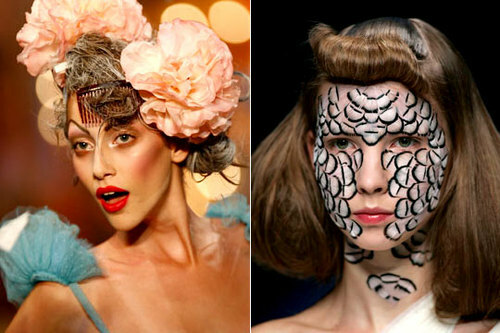 The possibilities for art and clothing are endless. I'm guessing that GirlPopcorn makes this look easy because she's done it so many times. When I do this project, I'll probably just do a simple line drawing so that I can master the process. I might start with a freehand drawing using a disappearing ink pen or an iron-on transfer pencil. 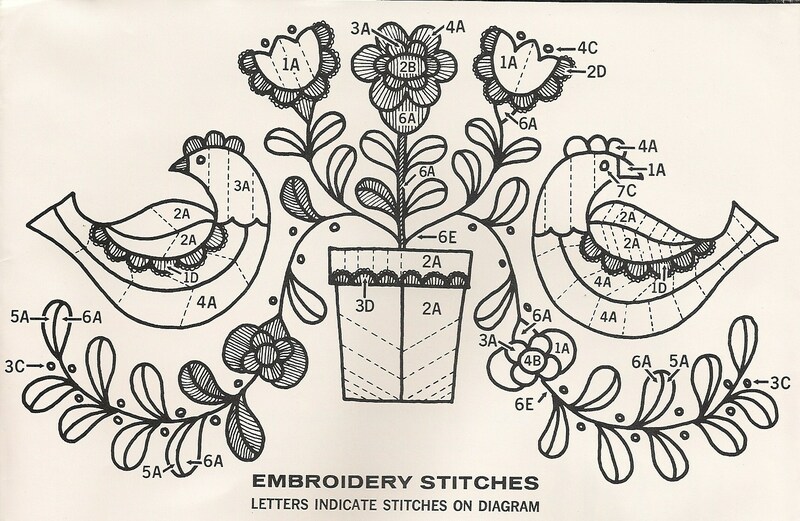 I'd also like to try using embroidery transfer paper to copy a drawing from an old book. My husband and I love to go for long drives on the weekend. We often wind up in some small town in time for lunch, which gives me a few minutes to get my bearings and find a good local thrift store. I found this Avon crewel kit in one such town - Prineville. The issue date reads 1973. Of all the vintage kits I've found in my travels, this is one I might actually keep for myself. Perhaps make it into a pillow. Here is a scan of the pattern diagram if you'd like to give it a go. I've been spending down my PayPal account on Etsy this week. 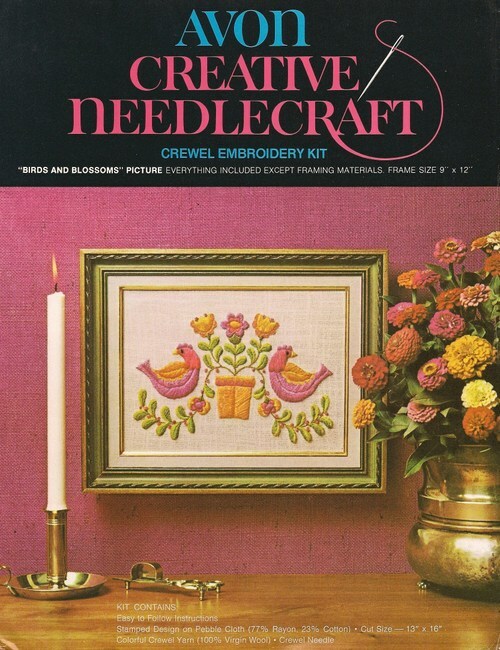 New to me was Etsy's "Alchemy" project; a service that links people with ideas to crafters with skills. You simply post a request for a custom item - it can be almost anything - and wait and watch as the bids come in. 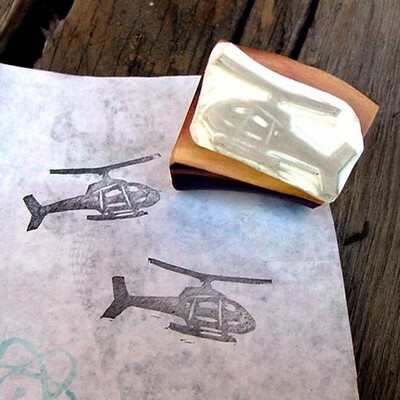 I posted an Alchemy request for a hand-carved rubber stamp. I received about five bids, and finally made a deal with Tresijas this afternoon. I chose Tresijas because I like the way her stamps look. That's her helicopter stamp you see here. The stamp she is making for me will feature the two kitties - we were inspired by a post from Oldschoolacres earlier this month. 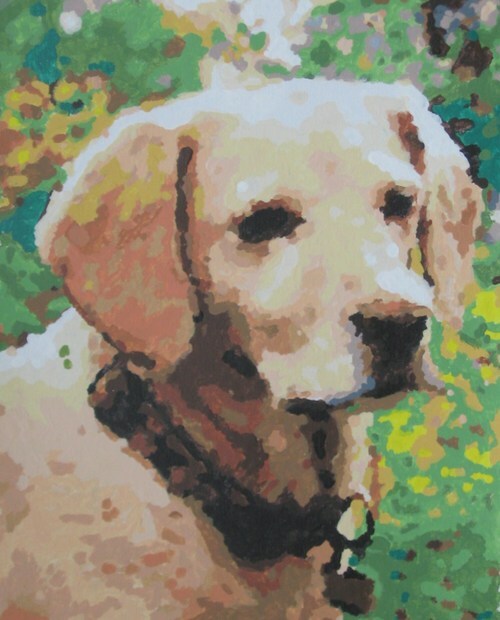 This painting of Buddy the dog is actually a paint-by-numbers kit ordered from www.easy123art.com. The site creates custom kits from your favorite digital photos. Now stand up and back away from the computer monitor. That's the best way to really see it. It's kind of impressionistic, if you know what I mean. I love the way the way the vertical folds of his neck chub emerge as you walk away. I'm happy with it, but honestly, it was much harder to paint than I ever imagined it would be. I feel silly even writing that but it's absolutely true. The computer program can pick up very subtle variations from the original photo, making some of the numbers and spaces on the canvas pretty darn tiny. I found that toward the end, I could only work on it in very short spurts. Part of me wishes I had bumped up the contrast or made my original photo black and white (by cranking up the "contrast" or dialing down the "saturation" using a photo editing software program.) It would have made this photo so Gerhard Richter-y.